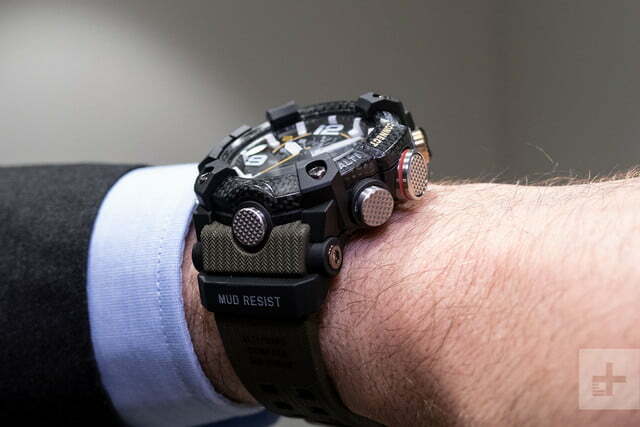 Casio is expanding the range of materials used in making its exceptionally tough G-Shock watches, and has introduced carbon fiber on several of its connected watches for 2019. 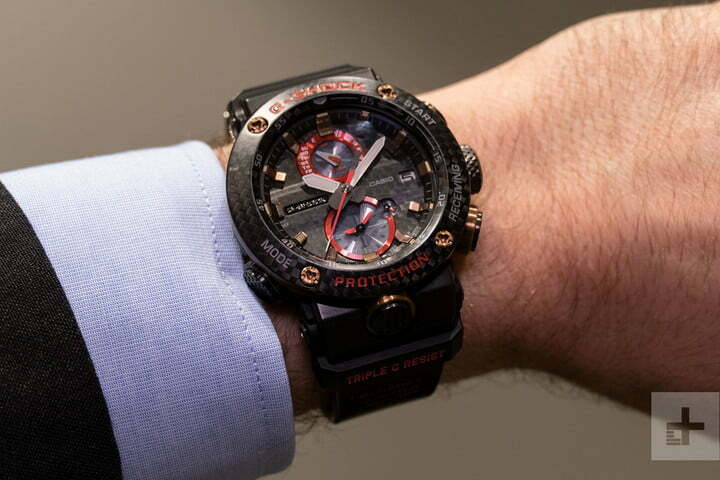 The GGB100 Mudmaster and the GWR-B1000 Gravitymaster are two of them — I got the chance to wear the two watches at Baselworld 2019, and talk to Casio’s research and development team about them. 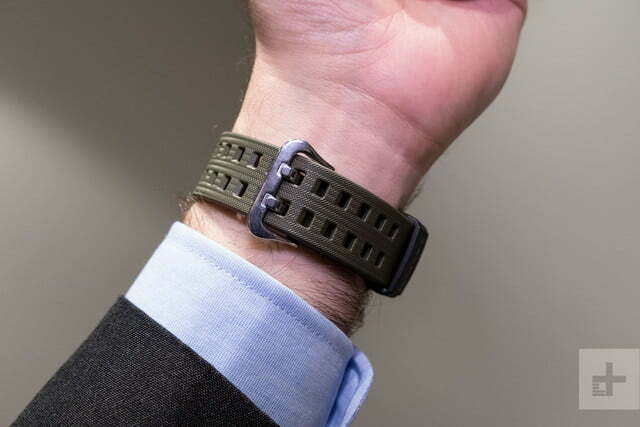 Casio started off using resin to make its watches in the early ’80s, then added metal in the ’90s, and now it has added carbon fiber — a material that is 10 times stronger than iron, at one-fourth of its weight. Paired with titanium on some models, it even helps add rust-proofing to the already tough G-Shock range — joining protection against impact, gravity, vibrations, and even centrifugal forces to make sure they remain functional in the harshest environments. 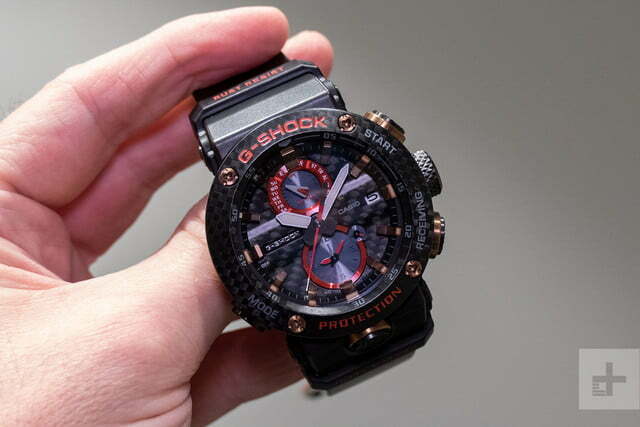 It’s not the first time carbon fiber has been used on a G Shock. 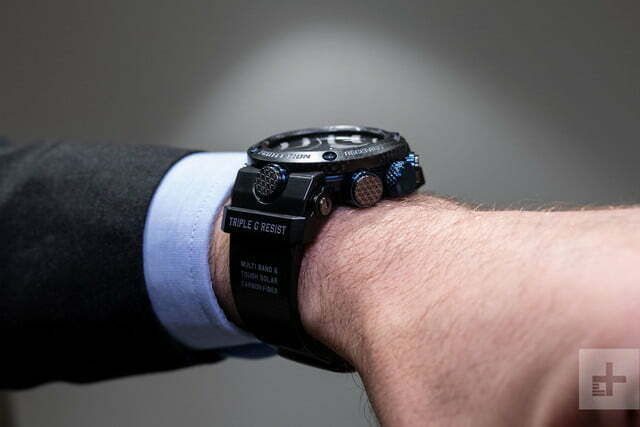 Models in the G Steel and Frogman range have carbon fiber reinforced straps, and carbon fiber bezels too. However, here it’s used throughout the case for the first time. The advantages aren’t just structural. It also impacts design. 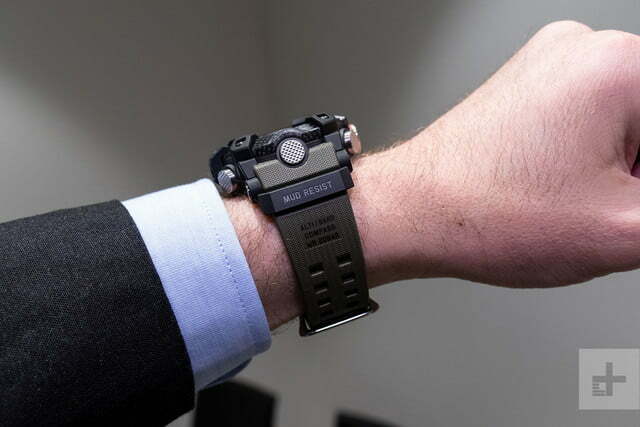 “Because carbon is so easy to shape, we can compact it, and the more you compact it the stronger it gets,” a Casio spokesperson told Digital Trends. The effect will become clear when we look at the new models, but the material’s flexibility allowed the design team to redefine the shape of its watches, adding strength to a completely new shock and water resistant structure, while reducing bulk. How about price? 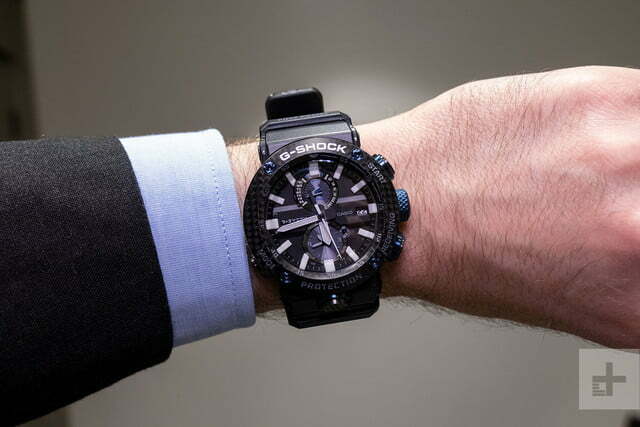 Carbon fiber is associated with a higher cost, so will G-Shocks using the material cost more? 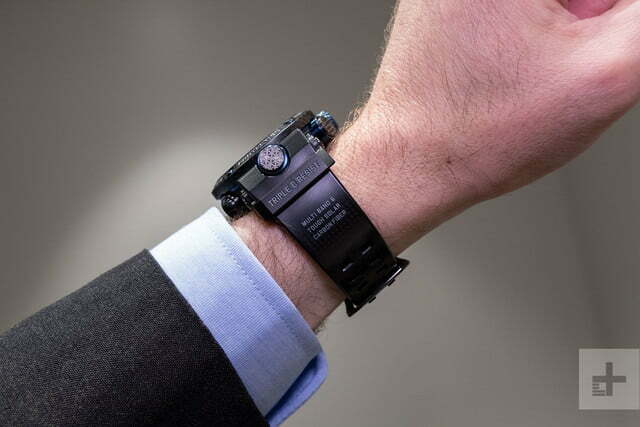 “We will continue to deliver on value while using top-of-the-line materials, so no,” a Casio spokesperson said. This isn’t a passing fad either. When asked about the future, Casio told us it will continue to use carbon fiber in its watches, providing similar benefits across the range. 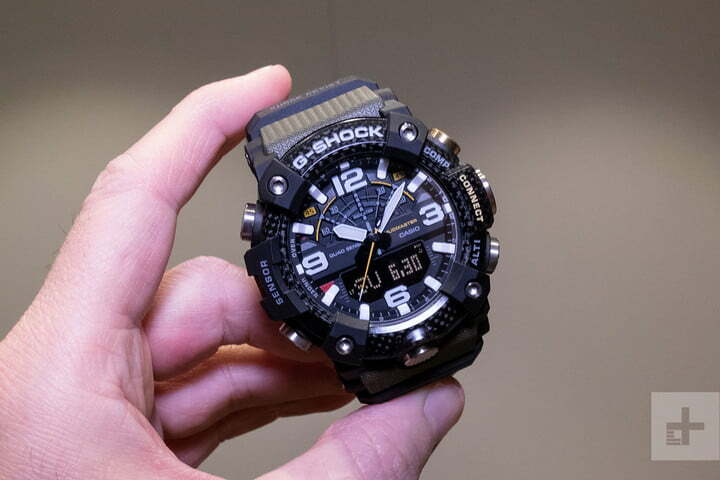 It’s likely to be used in combination with resin and metal, acting as the third core material used to make G-Shocks. 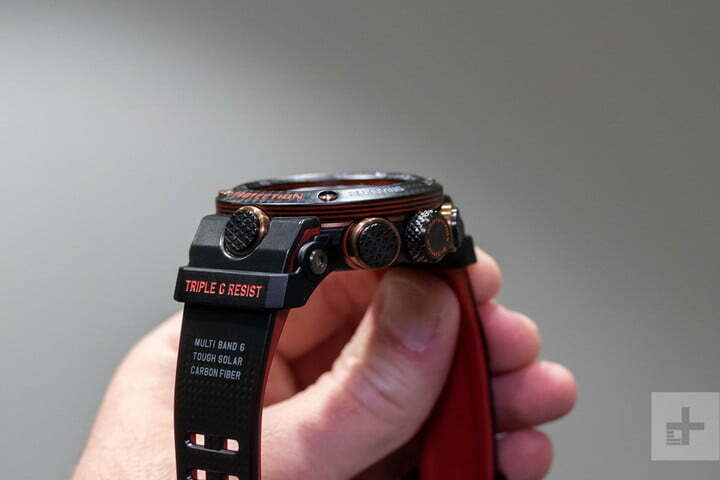 Carbon has been introduced in the Mudmaster, Gravitymaster, G-Steel, and MT-G series. 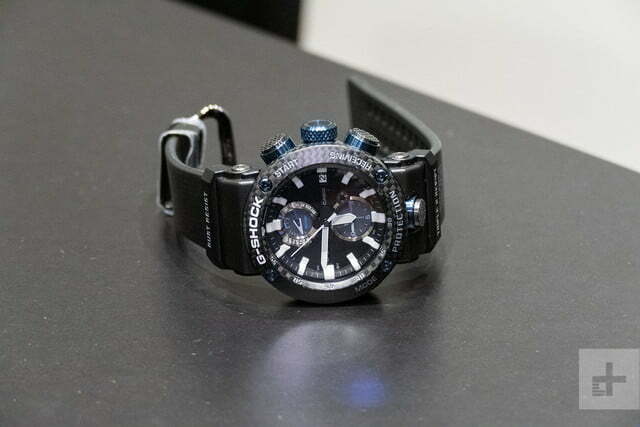 We concentrated on the Mudmaster and Gravitymaster models at our demonstration. The Mudmaster, Casio’s outdoor G-Shock watch, has received a high-tech makeover with new connected features, new materials, and a revised design. The Mudmaster has always been a tank of a watch, with its large ultra-tough case dominating any wrist it’s put on. The new GG-B100 hasn’t changed drastically, but through careful evolution, the watch has become more wearable and more useful. 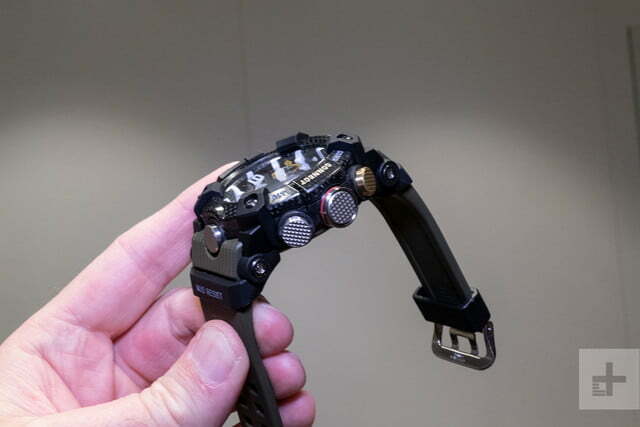 While the Gravitymaster line has had Bluetooth connectivity for a while, this is the first time it has been added to the Mudmaster. Working with the G-Shock Connected app — which we’ve always been impressed by — it will provide a location indicator, a mission log, and fitness tracking. 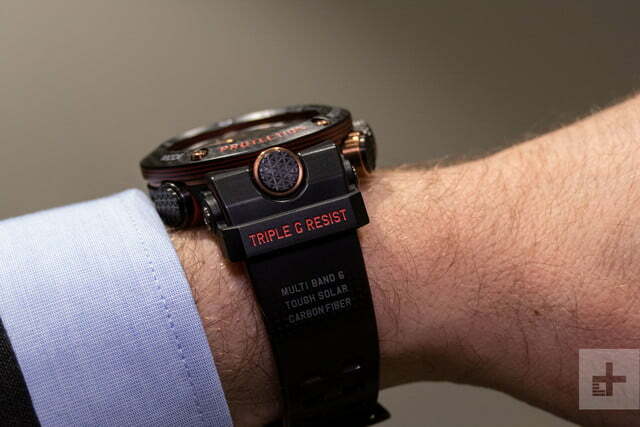 The step counter is enabled here due to an upgrade to the Mudmaster’s sensor array. Old models had two sensors, but the new version has four — an accelerometer, compass, thermometer, and barometer. Previously, Casio integrated step tracking into the GBA-800 fitness watch, but its inclusion here makes just as much sense. The Mudmaster is a watch primarily worn by outdoor enthusiasts, walkers, or those involved in sports like Tough Mudder. 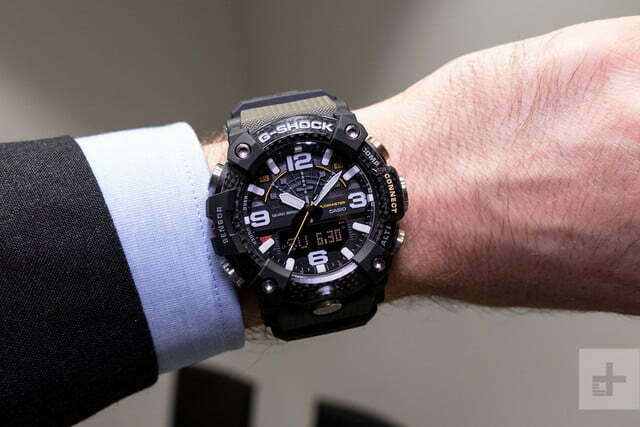 It’s a step below the G-Shock Rangeman, and less lifestyle and tech-orientated than the Pro Trek WSD-F30, but will appeal to the same people contemplating either of these alternatives. The app wasn’t ready when we tried on the new Mudmaster, as it’s still in development ahead of the watch’s launch. But step count showed up on the watch’s screen with a press of the top left button. The app uses data collected from the altimeter and the acceleromter to calculate calorie burn, while the Mission Log feature uses your smartphone’s GPS to plot courses and pinpoint locations. Just as handy for point-to-point navigation outdoors, as it is for remembering where you parked the car in an unfamiliar place. Like other connected G-Shocks, it makes changing time zones very easy without even touching the watch at all. Look closely at the buttons and long-time G-Shock fans will notice there are no protective guards around them this time. This is a design change facilitated by the use of a carbon fiber core, where carbon is sandwiched between the resin and bezel. That increases strength to the point where the guards are no longer needed. A filter stops dirt and dust getting inside. The Mudmaster also has a carbon fiber and resin bezel, while the rest of the body is made from tough resin, with a stainless steel back panel to keep the watch airtight. What difference has all this made to wearing a Mudmaster? It’s definitely more comfortable, with a slightly slimmer profile and reduction in weight. 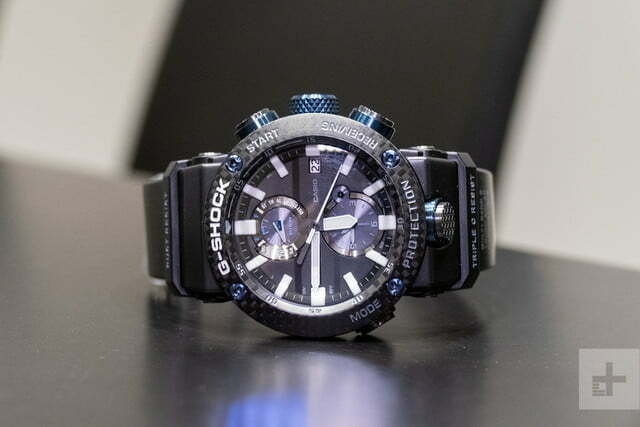 But the over-engineered design remains, which separates the Mudmaster from other G Shocks. It’s an uncompromising watch — massively strong, with a design to match. On the new model, the addition of a carbon fiber bezel and removal of the button guards has raised its visual appeal, and we expect more people will consider owning one than before. The advantage of adding strength and lightness using carbon fiber is even better illustrated on the new Gravitymaster GWR-B1000X model, which has a carbon fiber monocoque — unique to the Gravitymaster at the moment — altering the look of the watch considerably over the last models. In the same way as the Mudmaster, the large button guards have been removed for a more streamlined, less aggressive look. It makes a big difference when you put the watch on. It feels like an everyday wear watch, more reminiscent of the recent G-Steel models than the older Gravitymasters. Sapphire over the face adds a wonderful sheen, and an extra level of protection against damage. Carbon is also used for the bezel — 52 layers of it in total, again for scratch and damage resistance. The other advantage of using carbon is felt in the weight. The GWR-B1000X is the lightest Gravitymaster made at 72 grams, with no sacrifices made to toughness at all. The low weight and reduced size hasn’t impacted the solar charging either, and the smaller panel hidden in the dial has been optimized for even better performance. All the structural and design alterations are immediately noticeable when you wear the Gravitymaster. It’s comfortable in a way that big G-Shock watches often are not, meaning this could be a breakout model for those who like the look of a large G Shock, but simply couldn’t wear one due to the size or weight. The style has been improved too, with the machined buttons giving the watch an industrial, purposeful look, while the face and complications are as clear and concise as people demand from the series. Casio has retained the Bluetooth connection, but has not added the step count feature from the Mudmaster. It has the same time zone adjustments, phone finder, and Flight Log feature as before. Casio’s dedication to bringing connected features to its watches without losing the spirit and individuality of the design continues to help them shine. Match the evolving connected range with the introduction of carbon fiber, and you’ve got high-tech materials and manufacturing to match the smart features. The new Mudmaster’s step and calorie count is a true benefit that fits with the model, but it’s the Gravitymaster that uses carbon fiber to the greatest effect by massively improving the watch’s look and wearability. The Mudmaster GG-B100 will be released in May for $350, and it comes in the green seen here along with an orange and black color. The Gravitymaster GWR-B1000X will cost $1,000 in August, and comes in both blue and a limited edition black, red, and gold version complete with a carbon dial seen in our pictures.